Three fixtures are in focus, given their goal and clean sheet potential, for our Fantasy Premier League Gameweek 13 daily picks. 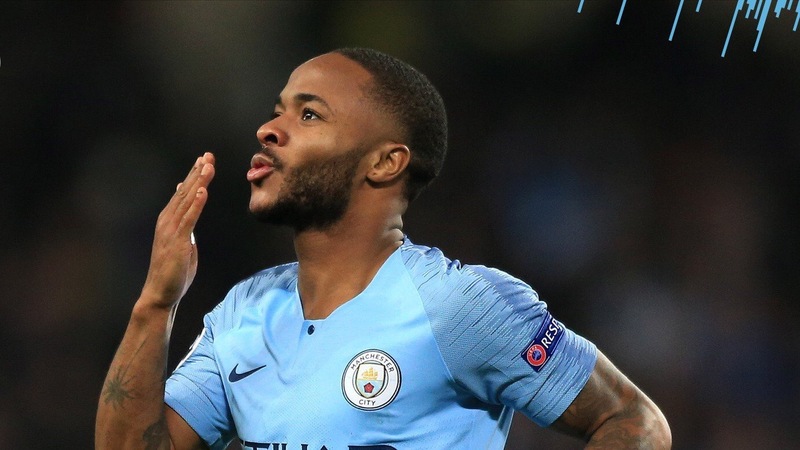 Whilst these selections are based on the Starting 11 game and scoring system, you may also find them useful and relevant for Fantasy Premier League Gameweek 13. It looks like another routine win for Manchester City this weekend, they have a great record at the London Stadium with 4-0 and 4-1 wins in recent years. 3+ goals should be a formality once more and the best defence in the league will be looking for a shut out after some odd decisions by Ederson in recent weeks. Sergio Aguero and Raheem Sterling look to be the biggest goal threats for Manchester City, and both are more than capable of an assist too. Aguero has 8 goals and 4 assists this season, plus Sterling has 6 goals and 5 assists. David Silva and Aymeric Laporte are the supporting cast. Silva is normally known for his assist potential, but it’s his recent goal scoring form of most interest, with goals in back to back games. Laporte will be looking for his eighth clean sheet of the season. This Gameweek 13 daily fixture should be goal friendly: these two sides have a combined 47 goals for the season, conceding 31 between them. It would be no surprise to see both teams scoring a couple here. It’s difficult to split the key men from Bournemouth: Callum Wilson and Ryan Fraser will be relied upon to create the goals. With a combined 9 goals and 13 assists, expect to see them involved, Wilson has scored in his three previous games against Arsenal. Granit Xhaka is central to Arsenal’s set play responsibility and Torreira provides plenty of creativity in the middle of the field. 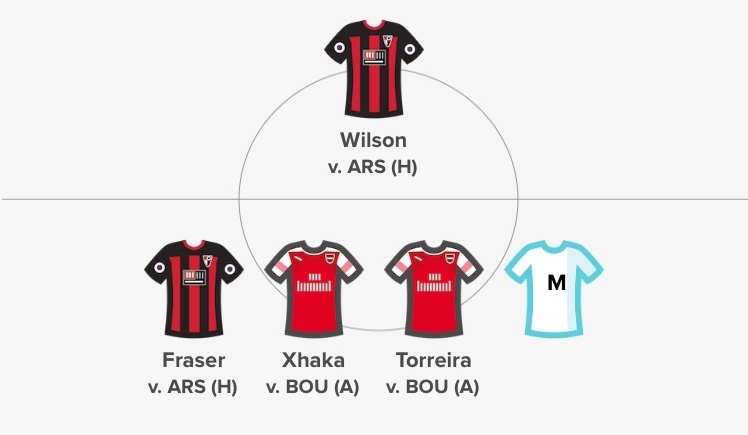 Both should score well for pass completion and tackles in Starting 11’s unique scoring format this week. Outside of the top teams, Wolves have one of the best defensive records in the league. It’s been slim pickings in recent weeks for them, but Huddersfield are the most goal-shy attack in the Premier League so a clean sheet looks likely here. 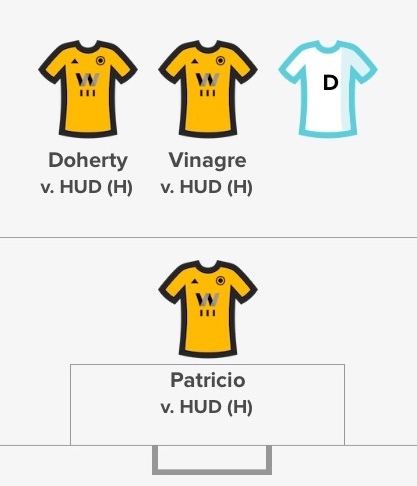 Matt Doherty provides the greatest attacking threat from wing back, and he’s joined by Vinagre who’s set to debut on the opposite flank. Goals or assists could contribute to their overall points total. Riu Patricio is selected between the sticks, looking to accumulate a clean sheet and save points. He has amassed 37 saves for the season, including 7 across the last two games. 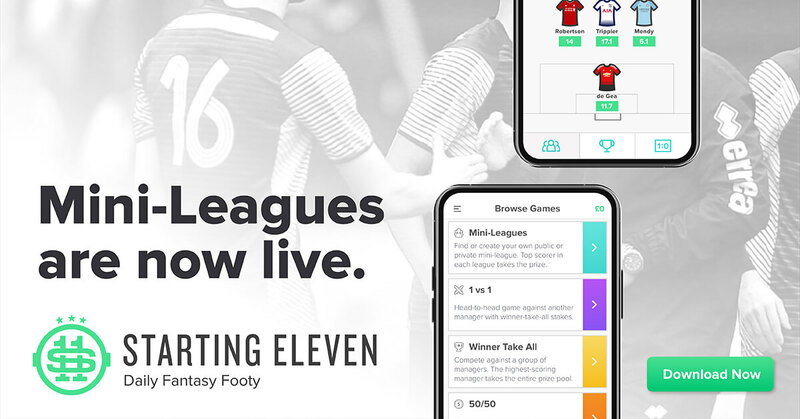 Don’t forget to read our Starting 11 Gameweek 13 Daily Mini-Leagues article – there’s a FREE retro shirt on offer for the winner of our free play mini-league this Saturday!